Are baked beans a staple in your pantry? You may be used to eating them on their own, putting them on toast or just having them as a snack. How can you turn the humble baked beans into a yummy main dish? Here are 6 easy ways to use a can of Ayam Brand Baked Beans and transform them into a delicious dish everyone will love. Need a quick, healthy meal after a busy day? 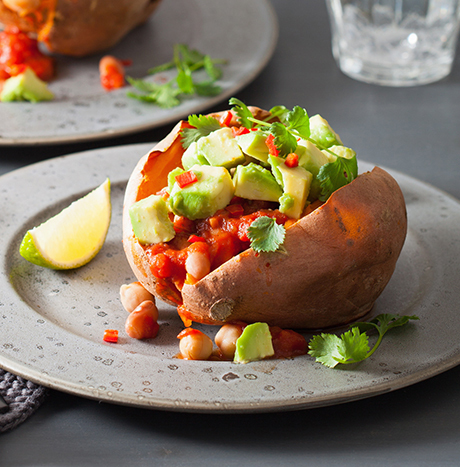 Potato jackets loaded with baked beans and avacado will satisfy your tummy. This simple combination of potato, beans, and avacado provides a low calorie, low cholesterol meal that's easy to prepare. It's full of nutrients such as Vitamin A and C, and the use of baked beans add not just flavour but fiber and protein. 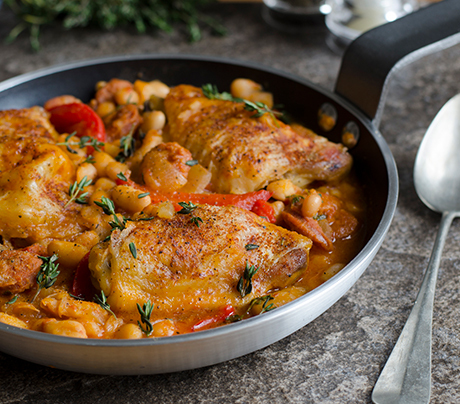 To make this an even healthier dish, choose to use Ayam Brand Baked Beans Light which is low in sugar and sodium. Get your taste buds going with this tasty starter! 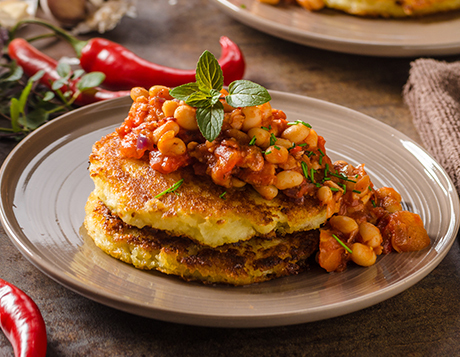 Spice up humble potato cakes by adding baked beans as topping. The potatoes provide the carbohydrates for an energizing appetizer. The beans are a source of protein and the tomato sauce from the baked beans provides antioxidants in the form of Vitamin C.
If you're looking for a new dish for this weekend's brunch, this dish will hit the mark! Consisting of breakfast staples such sausages and eggs, the addition of baked beans will add both flavour and nutritional value to your meal. 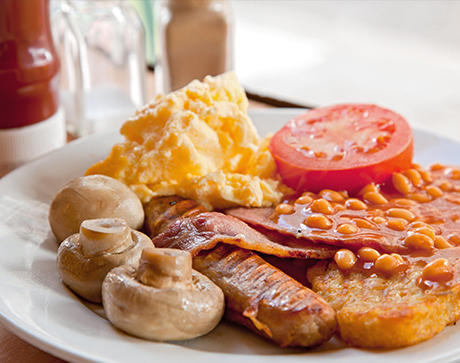 The tomato sauce in the baked beans will create a beautiful gravy that goes well with eggs and sausages. For added flavour, try using Ayam Brand Baked Beans Cheese which uses real parmesan cheese in the tomato sauce. This Asian-inspired dish will be a hit with all your family and friends, and it's simple to prepare. Consisting of 3 main ingredients, chicken, potatoes, and baked beans, this dish is a great accompaniment with rice. Here's new take on everyone's favourite bolognese pasta! 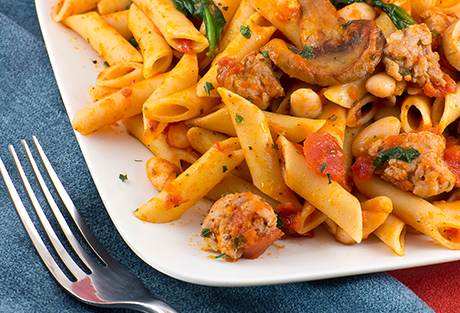 Instead of using just meat in your pasta sauce, try incorporating baked beans too. The addition of baked beans introduces more dietary fiber to the meal which helps keep our digestive system functioning well. The combination of meat and beans pack a protein punch, making this dish that's satisfying and healthy. Sometimes you just need a quick and hearty dish, and baked beans on scrambled eggs in an easy go-to dish to satisfy your tummy. 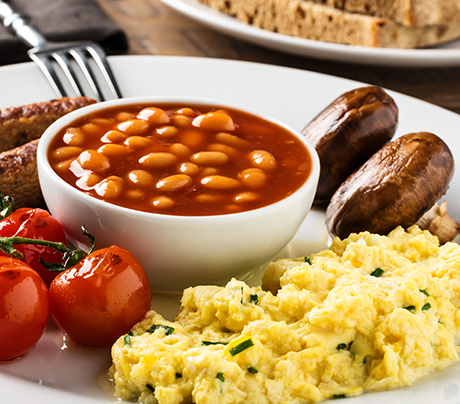 Adding on baked beans rounds out your scrambled eggs as they're good source of protein. You can also add some toast to the meal so you won't be missing out on any nutrients. This power-packed breakfast is full of good carbs, protein, and fibre and makes for a great start to the day! Ayam Brand™ products can be found in all leading supermarkets and hypermarkets.